Have you seen the mural that is Dural Lane? 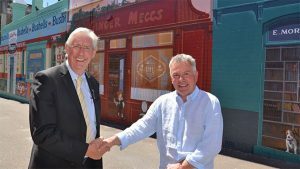 In a bold move, Hornsby Council commissioned Hughes Sineux, a French artist to paint a mural in Dural Lane and he has done an amazing job. Taking up most of the lane, which is just off Peats Ferry Road in West Hornsby, the mural depicts some great elements of history and local architecture. Hugues has more than 25 years of experience painting murals, both in his homeland and in Australia where he has lived since 2010. “Drawing enormous inspiration from history and architecture, I am passionate about creating pieces that are not only visually striking but also hold a deeper meaning for their communities,” Hugues said. 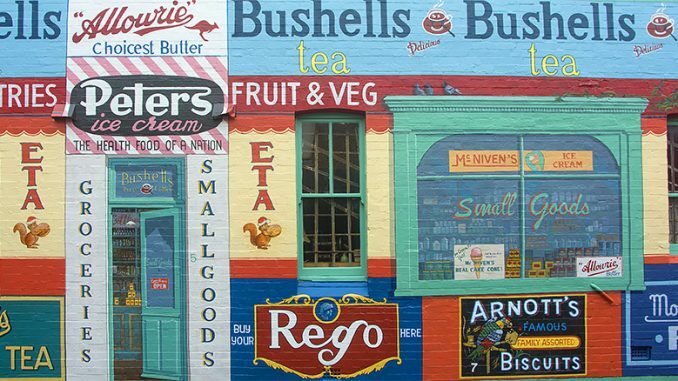 In his work at Dural Lane, Hughes has captured many traditional brands such as Bushells tea and Arnott’s biscuits, but he has also incorporated it all in to a street scene. Hughes created the piece over a couple of months late last year, often having to work long hours at the top of a cherry-picker in the narrow street, but the result has been well worth the effort. The style of work is called a tromp l’oleil, which is a French expression that means to trick the eye. The effect Hughes has created is that of an old fashioned street scene. 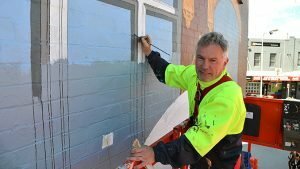 Hornsby Shire Mayor Steve Russell came across the idea for the mural when he was in France and walked past a similar example that he thought was an actual door. The work is now complete and well worth a visit as it adds to the streetscape of West Hornsby.